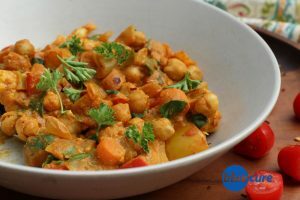 Chickpea red curry is delicious, quick and easy meal. It’s loaded with flavor and packed full with veggies. Chickpeas are a great versatile plant-based protein, that are also loaded with fiber, thiamin, vitamin B6, folate, iron, magnesium, phosphorus, potassium, zinc, copper, and manganese! This curry is made with cashew cream rather than coconut milk, making it a lighter fare. Serve with cauliflower rice for a light meal or with cooked quinoa to add more protein. To add even more protein to the dish, use 2-3 cups of beans or even diced tempeh. Make a large batch of this and use it for leftovers. To change it up, serve it over a roasted sweet potato or in a whole grain wrap with greens. *Add less curry powder and omit the cayenne if you want it more mild. Optional to add tomatoes. Wash and chop the veggies. Mince the garlic. In a pan, sauté the garlic and onion with 1-2 Tablespoon(s) of water. Sauté until the onions become soft and more translucent. Add the broccoli/ cauliflower, chopped bell pepper, and carrots. Continue to sauté until tender. Add more water as needed so the veggies don’t stick. In a high-speed blender, combine the cashews, tomato paste, water, ginger, curry powder, black pepper, cayenne, and low sodium veggies broth (or more water). Blend until smooth. Pour the sauce into the dish with the veggies and allow to simmer for several minutes on low heat. Stir often to avoid burning. Add the beans and greens and stir until well combined. Allow the greens to wilt. Serve the curry over cauliflower rice, quinoa, or a sweet potato. Optional to even wrap it in a whole grain tortilla. Enjoy!